The Friday morning is marked with a new ceremony called Ishantuiinpa (lit. Drinking turmeric juice) which is an indispensable part of the festival. Everyone is compelled to drink a little turmeric juice from the jar with a belief that it cleanses a person's stomach and intestine infested with worms or cures any gastritis problems, and one would remain healthy for the whole year. The ceremony is organised outside the festive house, where the three village chiefs: Hulak, Luplak, Zupai and the host (Lomtunpu) sit on the veranda facing east. The rest of the groups sit in their own respective directions. There are three different small pots filled with Ishantui, SawaiZu and Leizu and the senior girls (Sikan-nu) serve these drinks. This morning session begins with the war dance (only boys) like last night inside the house as soon as the Tangnga-rinta's members start singing. Then, the dancing group comes outside after completing three songs, who continue dancing encircling the courtyard. When the dancing and singing stops, the three Sikan girls offer the members the three drinks Ishantui, SawaiZu and leizu as part of a break after a short prayer by the chief. Then, singing and dancing continue for a while. Today, they observe another two very important cultural aspects before concluding the session. 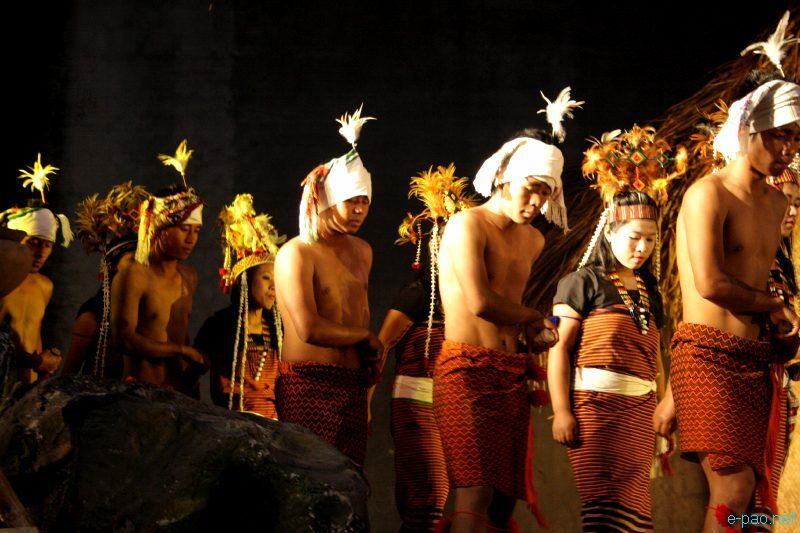 Firstly, they have to sing all the Meebo-la songs (Commemoration song of their ancestor or lineage or the clan head's). Secondly, by the end, the boys have to perform a special dance called Airekung lam (lit. peacock's dance, or hand twisting dance) without the hilted sword (Chumtun). Then, by the end of the song, the dancing party and all the members present goes inside the house. The host offers a short prayer to conclude the morning session. Afternoon Session - Sire and Najui Dances: After lunch, all members assemble again in the festive place for the afternoon celebration. As the song begins, two Hacharis initiate by introducing another new dance called Sire lam (lit. animal/ wild bull dance) without using Chamtun, in which two young girls join them. Here, they call the boys' dance as Sirelam and the girls dance as Najuilam (lit. maiden dance) or Leikoilam (lit. spinning flower dance/ hand twisting dance). After each song, new batches of boys and girls dance encircling the northern house pillar. Even guests are encouraged to participate in dancing with their girls. During this dance session, a young boy openly invites or drags out a girl of his choice to dance with him. Perhaps, if the maiden refuses to dance together or the boy fails to convince her, he is mocked and teased. However, at the end of this session, the young girls (helped by womenfolk) should sing their folk songs: Shangphoulaa (lit. Songs of drying the paddy) , Athinlaa (lit. eliciting/ provocative song), etc., in which, only the girls dance and compete amongst themselves by exhibiting their skills and talent. They adjudge the best dancer of the year among the maidens who dances gracefully and perfectly. After each song and dance, many Zurums follows. In this session, they perform no rites, rituals nor Chamtun (hilt sword) dance. This social celebration of singing and dancing expresses deep emotional attachment with many of them. Nungak-luthei Sikan-Ongpa Ceremony: By evening, before they conclude this afternoon session a ceremony called Nungak-luthei Sikan-ongpa (lit. youth penalty/ official report) is performed. Three senior girls and the three senior boys sit side ways on alow bench and sing three Sikan-laa songs in honour of three clans represented by these three senior girls (the womenfolk assist them). After this, the Hulak, Luplak and Zupai join the three girls near the big wine pot and then, a junior youth (Leibak) formally request them to sip the rice beer. After which, the senior most girl (of the three) distributes her tobacco leaf (Thakna) to each of them: first to the host and his wife, secondly to the three chiefs and lastly to the three senior boys. The other two girls follow the same formality after sipping the rice beer. By tradition, these girls, as leaders of their groups, have to make formal reports of their grievances to their chiefs for any mistakes/ wrong doings during the feast. When these girls complete their reports, they exchange their seats with the boys, who follow the same formal procedure and reporting to their chiefs. After this formality, the girls return to their original places. However, the three senior boys designated as: Tanglai-chang, Tuishak-chang and Tanghung-chang finally perform their thanksgiving act (Thoukeipa) as last part of the Sikan-ongpa ceremony. This Thoukeipa act is similar with the Tangnga-rinta unit but the referral term used and the persons are different. Friday Evening Session-Innku Rhinneipa (Tuichumloipa): When the Nungak-luthei Sikan-ongpa ceremony is over, all the members proceed to Hulak's house for the Innku-rhinneipa or Tuichumloipa (lit. roaming at precipitation's house). The same evening procedure follows, except that the offertory prayer and Zurum are done in the veranda and the host provides various edibles and sweets to all the participants instead of meat chutney (Maytum). Then, the mutured-adult members sing a song and three-four boys dance around the courtyard and at the end the host offers some money to the youths who praise and wish him a prosperous happy and healthy life for his generosity. This visit is more like the Christmas carol where some rich families donate money and refreshment. Similarly, all the members proceed next by next to all the Council of Elders' house in a hierarchical manner and conclude at the youth's festive house (Nungak-Luthei Bungkung) and thereafter, the youths remain at the festive house merrying. Thereare no ceremonies or programmes on Saturday morning and afternoon, so the villagers re-energise themselves. However, by evening around 5-6 pm, everybody gather at the festive place for another ceremonial feast called Bampui Jairik Hongni (lit. the day the proposer comes to stay). This is the third and last stage of the festival. For this evening ceremony, the old SawaiZu wine pot was replaced with a new pot (symbolising another ceremonial aspect), and so the procedure of Tongthigitpa ceremony like Thursday evening was similarly done. Interestingly this Saturday evening is exclusively meant for the maidens who receive marriage proposal during these festive days. Therefore, the womenfolk's help in grooming their young girls before she is sent-off (like the Hindu pre-marriage ceremonies of 'Mehendi' and 'Tilak') since, the other girls spend the whole evening grooming, cheering and teasing the proposed girls. The ceremony begins with the offertory prayerby the host and other similar formalities. The village council members also made brief discussions with regards to the proposals, if any. Then, the girls began to sing their folk songs:Tamparai-laa, Hungchongbangpa, etc. where both boys and girls dances till mid-night gleefully. Subsequently, the chiefs (Hulak), Luplak and Zupai left after home escorted after each performing the thanksgiving prayer. The responsibility of the rest of the festive night lies with Tangsha. Like the Thursday evening, the boys and girls stayed back at the festive place and continued their merry-making, drinking, dancing, teasing, joking, eating, etc. One need to appreciate these Innampei and Bampui celebrations as it helps the teenagers in socialisation and cultural education processes to adulthood. During this festive season, they maintain a strict moral code of behaviour despite the open and liberal opportunity rendered to the youth to court, romance and propose a girl of their choice. If a person commits any misbehaviour acts not conducive to society, the village council will take immediate disciplinary action on the culprit, and the family's reputation will be disgraced. Therefore, there is hardly any room for a person to go wild, crazy or misbehave because of the rigid systems. Since, the Chothe began their festival with benediction prayer they alsoconclude with a valedictory prayer of thanking for the blessing bestowed upon them during the festive days. This valedictory prayer is term as Konjai Jaicheihoungpa (lit. the gathering of crystal ball divination) which is perform in the morning by the village priest at the sacred grove (Temple). The priest reports all the matters including the divination of ominous signs to the village chief, host and other important village leaders. Then, chief made the short prayer. Second Session -Youth Initiation Ceremony (LeibakManpa): After the priest team return, the next morning's session is the initiation ceremony (Hayan or Leibakmanpamanpa) and the youth's game and sports. If any teenagers who wish to be initiated or join as member of the youth (Nungak-Luthei Bungkung) or any senior youth who wish to be promoted to Matured-adults (Tang-ngaringta) groups performs at this hour by simple ceremony. The initiation fee of a boy to be young soldiere (Leibak) is a rooster (preferably red in colour) and a bottle of Leizu (liquor), and for a girl it is also a bottle of Leizu and a bundle oftobacco leaves (Thakna). Secondly, if there is any grievances matters the matters are taken up today by the village council after paying the fee of a bottle of wine (Leizu). However, if there is none, with an offertory prayer the youth began to play their indigenous games and sports such as : wrestling (Tabun), shotput throw (Tanghung-lungthong), wine pot snatching (Zuhomlakpa), etc. at their open ground (Laman) as part of their training and outdoor entertainment program. Evening Session -Dismantling Ceremony (Ashina Sikan Ongpa): By 5-6 pm all the members assembled again for the dismantling ceremony (Ashina Sikan Ongpa) at the youth's festive house (Nungak-luthei Ruishang). This formal dismantling ceremony is similar with the Nungak-luthei Sikan Ongpa ceremony as stated above. When all other ceremonial formalities have completed and the host did the overall thanksgiving prayer, followed by the last wine serving (Zurum). Then, the three senior youths performed the last official report (Thoukeipa act) to the elders, after which, they officially removed the seven wine pipes (Tongthi) from the big pot according to their customary formula and also the wine pot outside from the house to signify the festival has concluded successfully. In the meantime, the Council of Elders made a brief discussion for the upcoming important village road / gate ritual (Lamlehleithoipa) i.e. ; on the following Saturday (see Chapter 6, 'Village rituals: Lamlehlethoipa' in Chothe Indigenous Religion and Culture: A Sociological Study(2018).